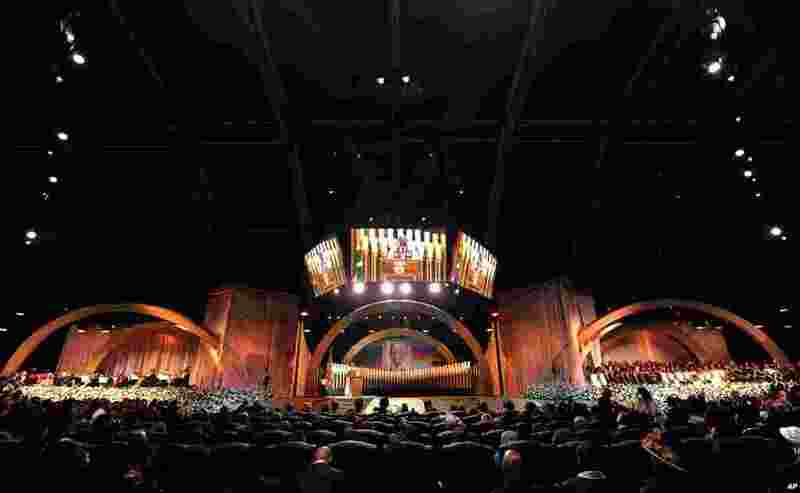 World leaders and celebrities were among the thousands of people who gathered to honor Nelson Mandela in his ancestral home of Qunu. 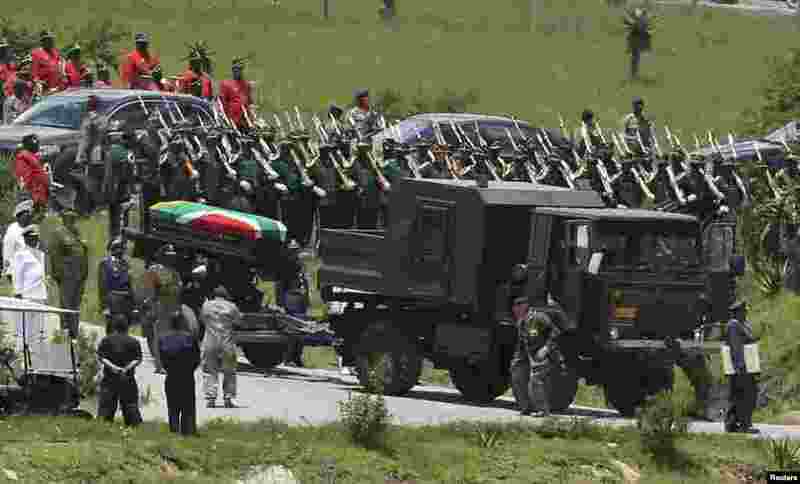 1 Former South African President Nelson Mandela's coffin arrives at the family gravesite for burial at his ancestral village of Qunu in the Eastern Cape province, 900 km (559 miles) south of Johannesburg. 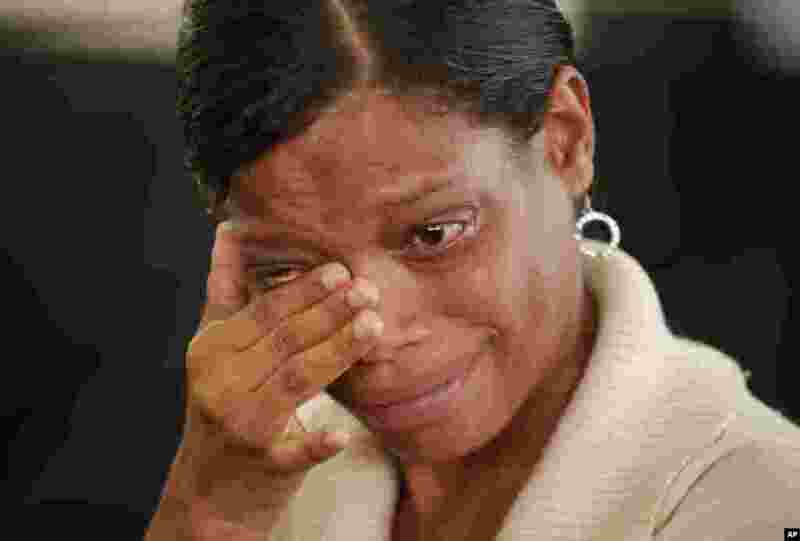 2 A woman wipes away a tear while watching the funeral of former president Nelson Mandela on a big screen at the Nelson Mandela Foundation in Johannesburg. 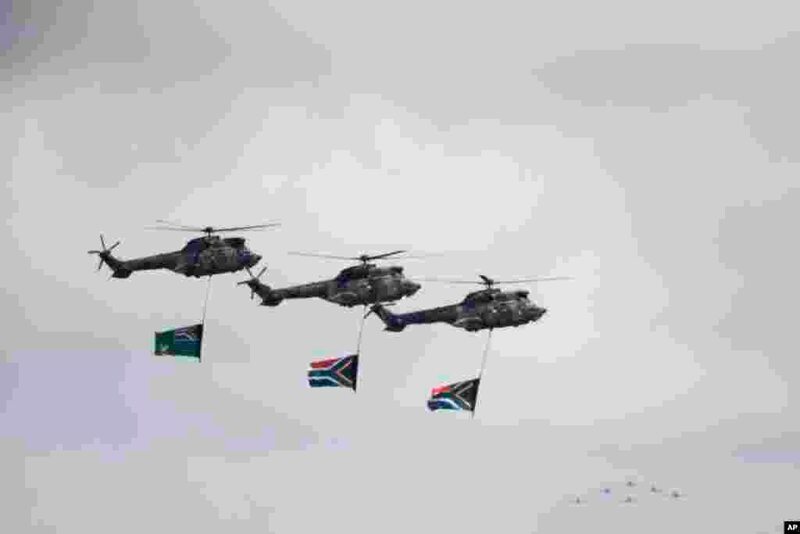 3 Three helicopters fly over the gravesite during the burial of Nelson Mandela in his hometown Qunu. 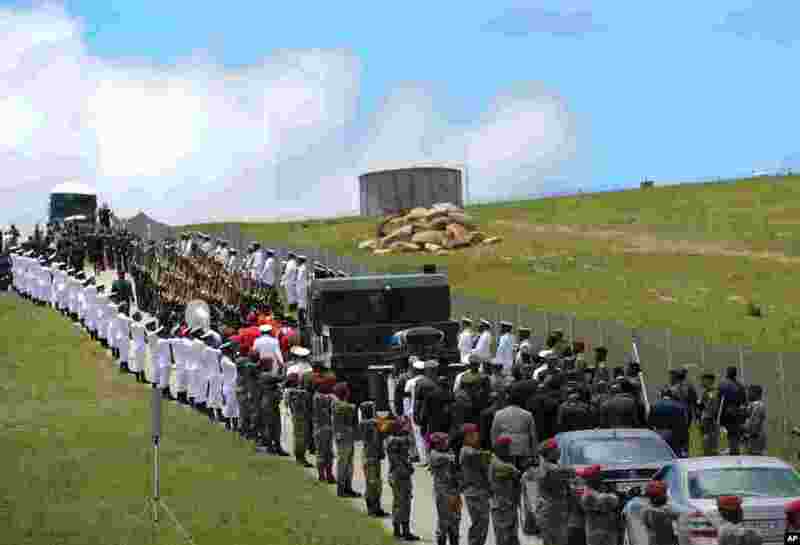 4 Military personnel line the route as former South African President Nelson Mandela's casket is taken to its burial place in Qunu. 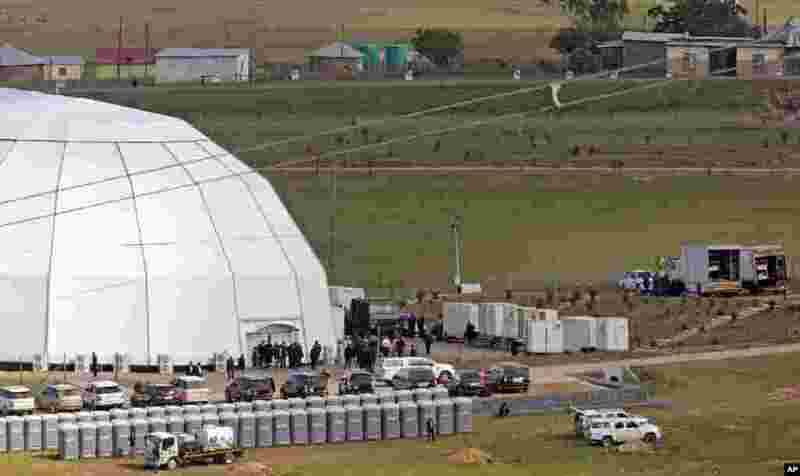 5 General view of the tent where the funeral service for former South African president Nelson Mandela is taking place in Qunu, South Africa, Dec. 15, 2013. 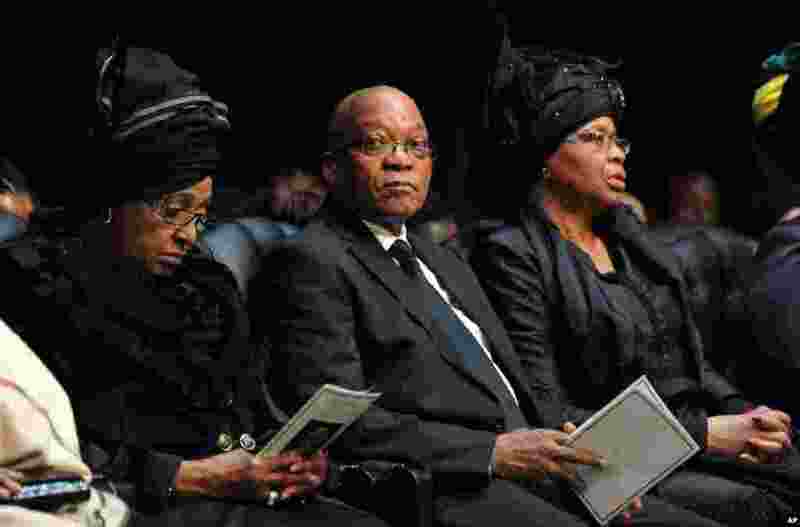 6 South African President Jacob Zuma sits between Winnie Madikizela-Mandela, Nelson Mandela's former wife, and Nelson Mandela’s widow Graca Machel, right, attend the funeral service for former president in Qunu. 7 People stand outside the dome where the funeral of former South African president Nelson Mandela is taking place in Qunu. 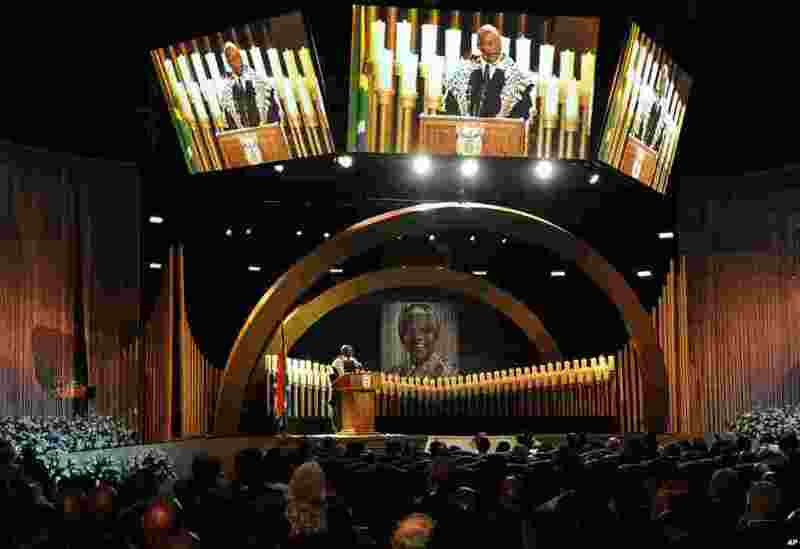 8 Chief Mantanzima speaks during the funeral service for former South African president Nelson Mandela in Qunu. 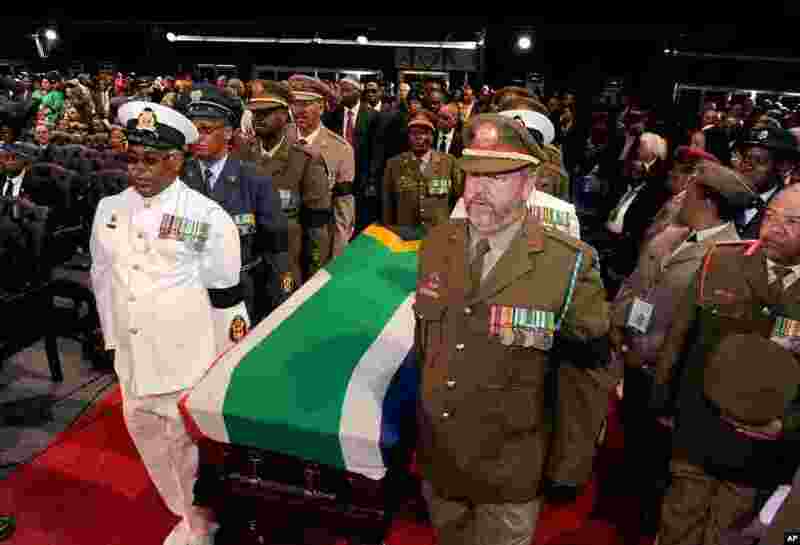 9 The casket bearing the remains of former South African President Nelson Mandela is brought into a tent for his funeral service for in Qunu. 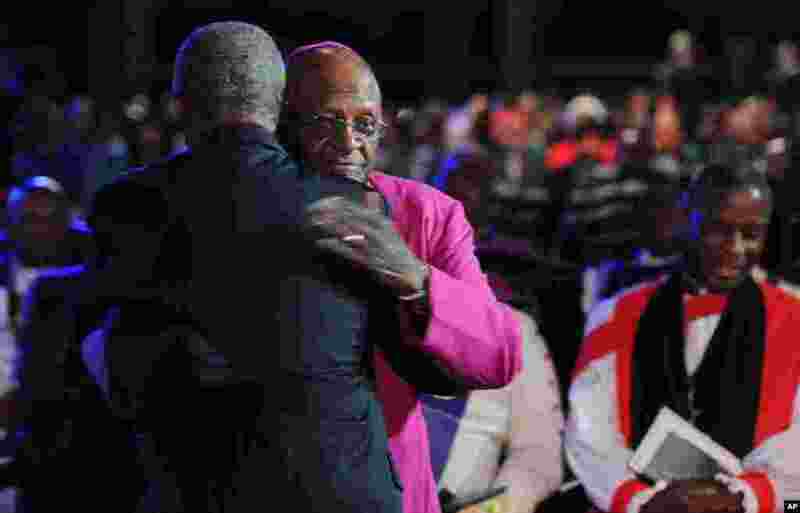 10 Archbishop Desmond Tutu is hugged as he arrives for the funeral service for Nelson Mandela in Qunu, South Africa. 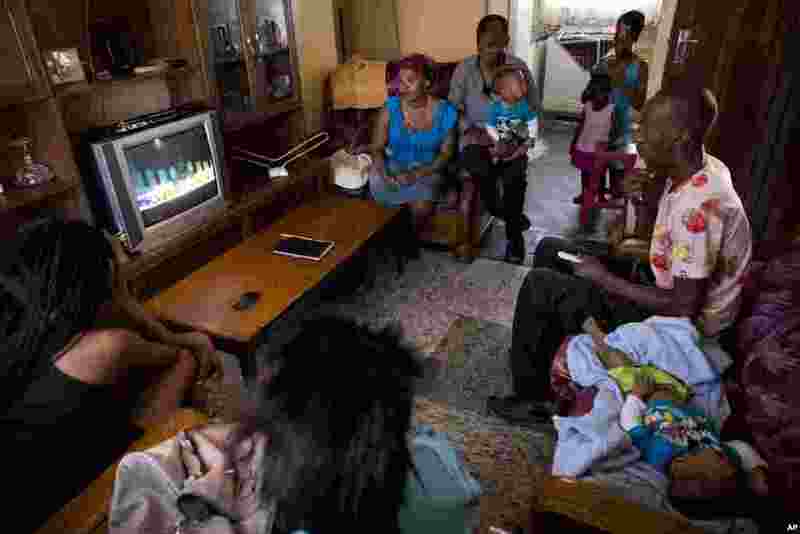 11 Members of the Mdakane family watch a television in their home showing the funeral service of former South Africa President Nelson Mandela in the Soweto township, Johannesburg. 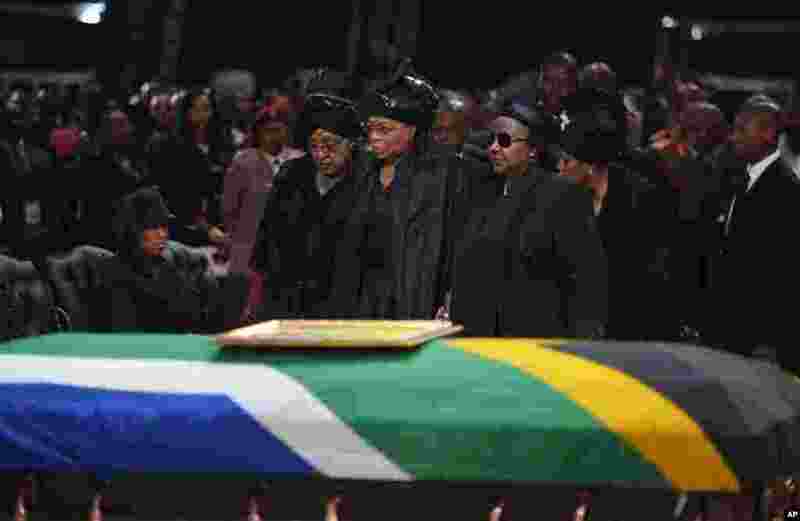 12 Winnie Madikizela-Mandela, left, Nelson Mandela's former wife, left and Nelson Mandela’s widow Graca Machel stand over the former South African president's casket during his funeral service in Qunu. 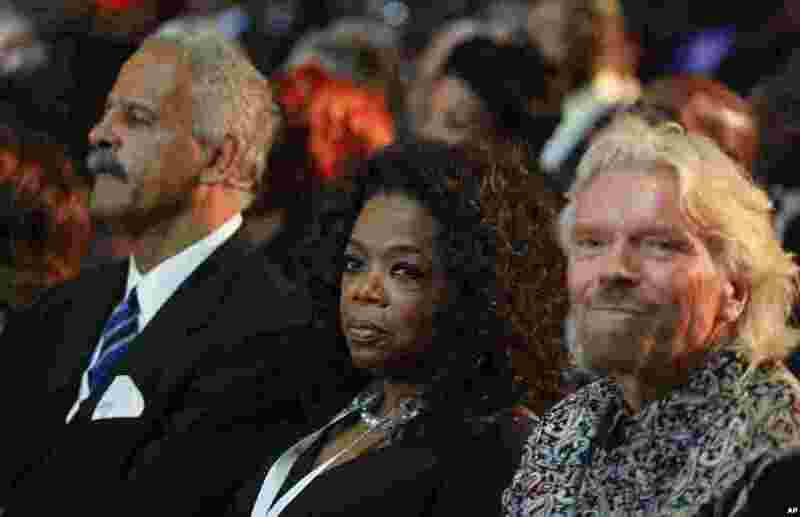 13 British entrepreneur Richard Branson, right and television host Oprah Winfrey attend the funeral service for former South African President Nelson Mandela in Qunu. 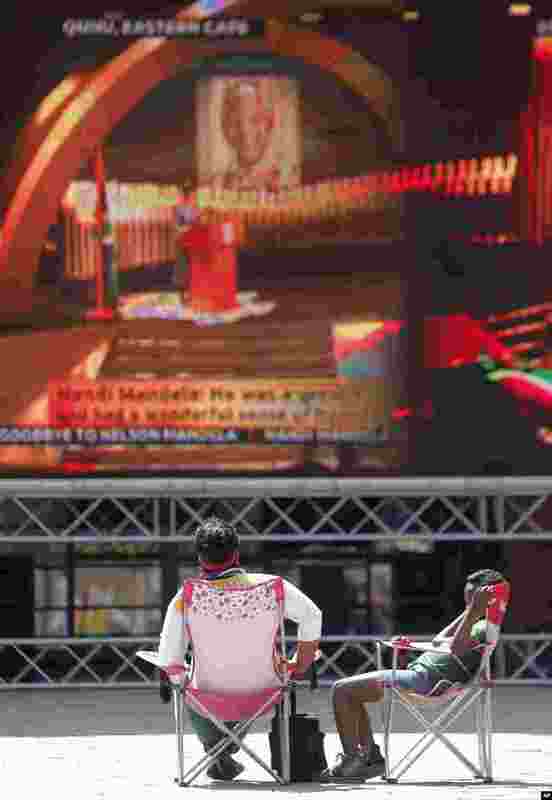 14 Two people follow the proceedings of Nelson Mandela's funeral on a big screen in Nelson Mandela square in Sandton, Johannesburg.